The giant clock – a remnant from the building’s original avatar as a train station – in the atmospheric cafe of the Musee d’Orsay, Paris. 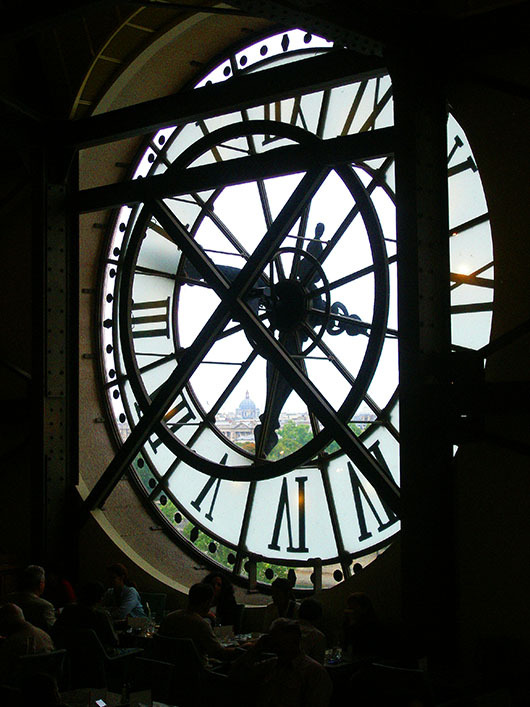 So much to do, so much to see, and so little time……..
Musee d’Orsay – my favourite Museum in Paris. Not for the exhibits but for the place! Mine too Andrew. What a gorgeous building. I loved their collection too, especially the impressionist section. ..and so many blogs I want to read! To be honest, you shall get the emotion of this city living there… so to catch all her little peculiarities. The best? Spend few months (perhaps studying at the conservatory of music or taking some painting and art history course! Excellent choice Madhu, as time is the most valuable thing we have!! Love this post. Your picture and quote are perfect. The one thing we cannot redeem is time. Nothing as valuable as time!! Excellent choice. Time is precious, therefore very valuable. Great photo. I value this special post; the clock in the Musee d’Orsay is the perfect choice for your time value. Thank you, Madhu! Amen! Hence, we do our best with time we have. Loved yuour photo. That’s a great museum! Fantastic perspective in your photo with the theme. Every moment IS gold if one treats it as such. Glad you liked it Fergiemoto. Couldn’t think of anything more valuable and having that photo helped. Beautiful quote and pic, Madhu. A valuable part of history … excellent entry to the challenge. Love the quote you chose as well. Thank you Mags 🙂 It is a beautiful (but pricey) cafe. I love the Musee D’Orsay and I chose Paris this week too, how spooky is that? What a great shot, I don’t think I can post for Jake’s challenge this week, just can’t think of anything. That is indeed spooky! Your Louvre entry was funny 🙂 I don’t always take part either, if i don’t have a photo to match. Doubt i can come up with anything for Robin’s challenge this week. For all of us, especially as we get older! That is an amazing clock! You do 🙂 Thank you for the visit and comment. So true! I love that place so light and airy and full of beauty. Thanks Jo. Sometimes we don’t need very many words to express our thoughts! Perfect entry Madhu!!! Just perfect!!! Don’t make me more envious girl. just visited Arindam and he suggested to visit you and since i read … ‘she hopes to convey some of that passion, to inspire you to spread your wings…’ i knew i must run over and meet you! Hi Madhu! I’m sure we will see each other running through the WP neighborhood and if not, over at Arindam’s place. 🙂 See ya!